Quick and Easy Gift Alert! 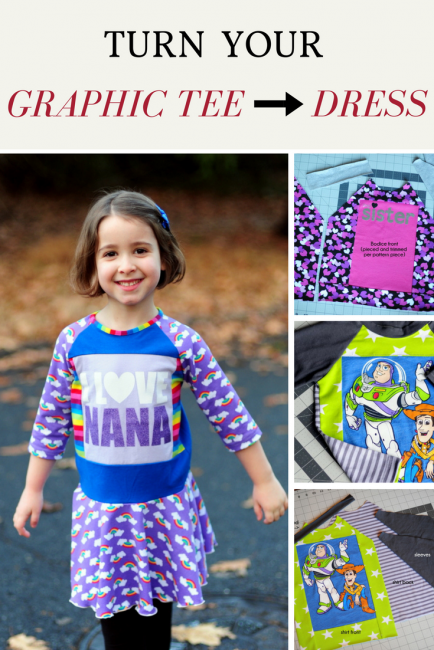 Turn a Basic Graphic Tee into a Fun Pieced Dress or Top - Peek-a-Boo Pages - Patterns, Fabric & More! 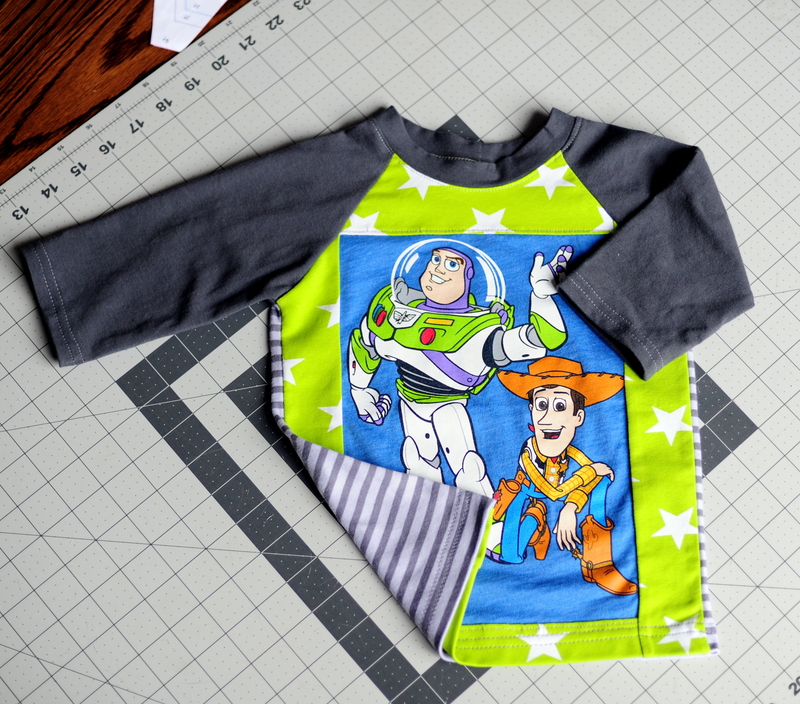 Have an outgrown tee laying around? You’ll love this tutorial! 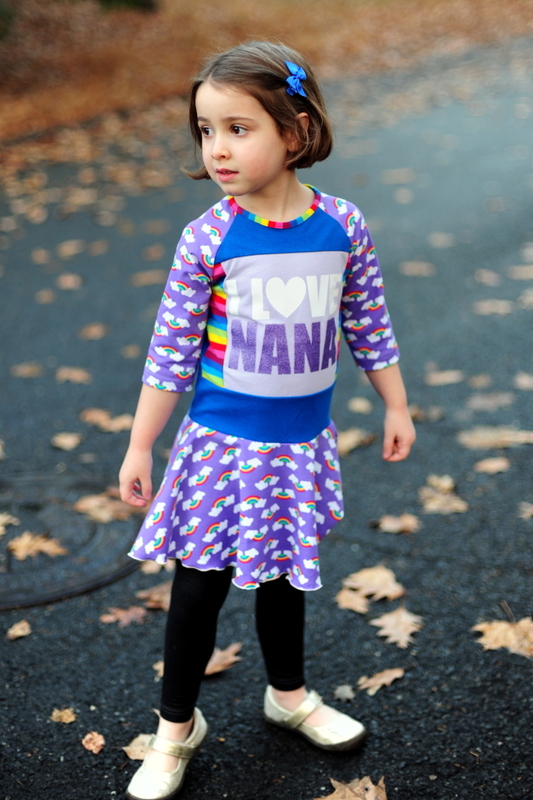 Upcycling graphic tees is quick, easy and fun! I decided to share a quick and easy gift idea that I use for birthday gifts year round, but would make a great personalized holiday gift for the kids on your list. There are a number of popular sewing patterns for upcycled t-shirt dresses (I’ve used, and love, several of them) and in general they offer more options than I’ll be including in this tutorial. 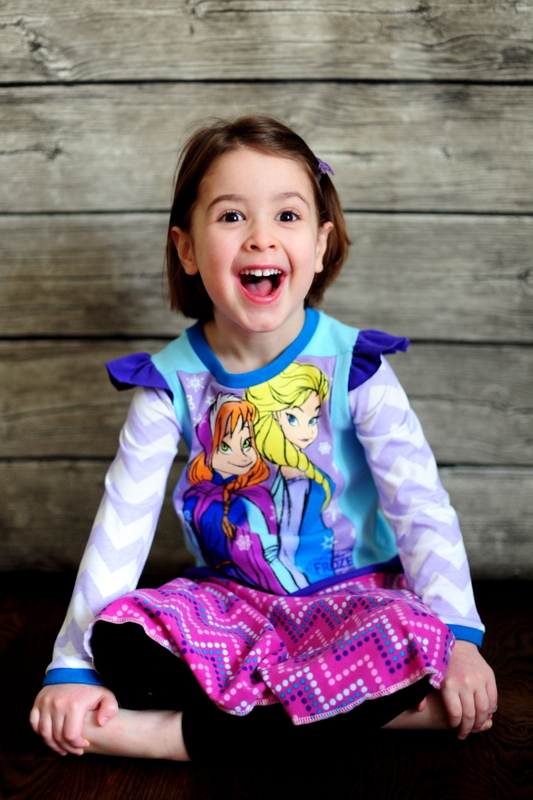 Sometimes I find all of the options overwhelming, though, and I just want to turn an outgrown tee into something new for my kiddo – chances are you already have a lot of these pattern pieces (knit bodice, sleeves) in your files, and with a few measurements you can pretty easily and inexpensively transform a basic tee into something fun. 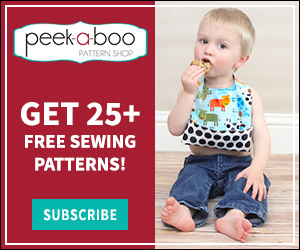 You’ll need your usual sewing supplies (including a ballpoint needle for knits and your serger if you have one – if not, I’d recommend using a zigzag or stretch stitch on your sewing machine), a graphic tee, and a few coordinating knits. You can use scraps for some of the pieces (especially the smaller panels for the front bodice and often sleeves as well) but will likely need a slightly larger piece (half yard or more, depending on the size you are making) for the skirt if you’re making a dress. I love using solids, polka dots, and stripes to coordinate with my tees – I like the solid cotton/lycra knits from the Purple Seamstress (Melinda Dozal) on Facebook or the Kaufman Laguna Jersey knits (you can find them on fabric.com among other internet retailers) and I get a lot of my stripes and dots from Purple Seamstress as well. 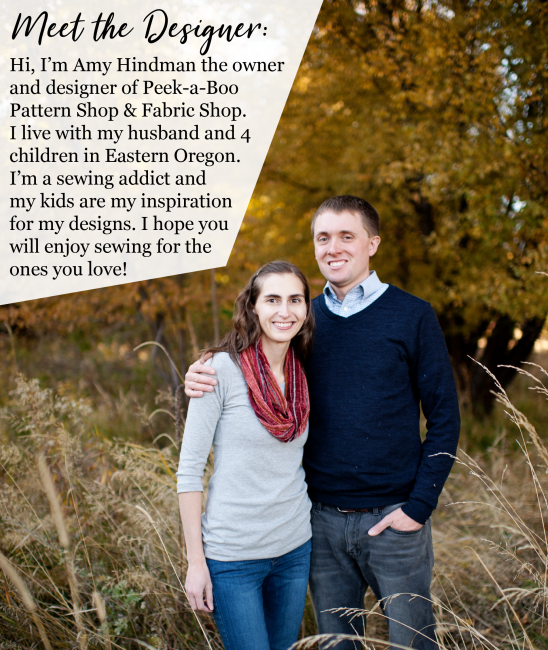 I also buy a lot of knits from Funkalicious Fabrics and from Fabric Dealers on Facebook. Joanns has a small selection of knits but some stores have more than others and you’ll want to poke around in various sections to find them all – I’ve found nice knits with the juvenile prints, the performance fabrics, and the seasonal “fashion fabrics” sections. And I don’t have a Hancock’s Fabrics anywhere near me but have ordered their cotton interlock in various colors online and it is thick and a great quality. I prefer to stick to jersey knits and cotton/lycra knit blends for the skirts, though, since they have better drape than interlock. This was less than a year ago, and P looks so little here – wow! The easiest and simplest way to do this is to buy a shirt that is the recipient’s size, add a skirt, and you’re done! 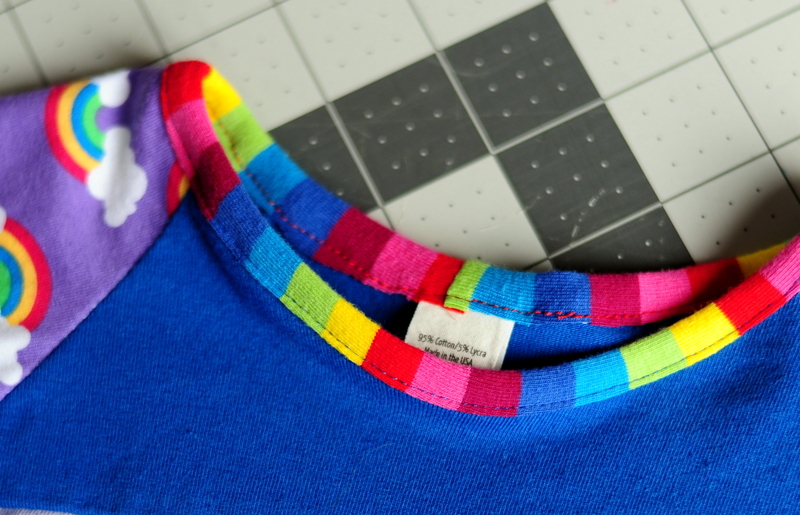 🙂 Most of the time it’s not quite that simple, though, and I have found that the knits used for graphic tees is often quite thin and less than ideal anyway. Using this basic method, you can use any size shirt you find (which is great when you’re shopping the clearance rack and can’t find the exact size you want) as long as the graphic isn’t significantly bigger than the size of your bodice (as the graphic would get cut off when you trimmed your pattern piece). 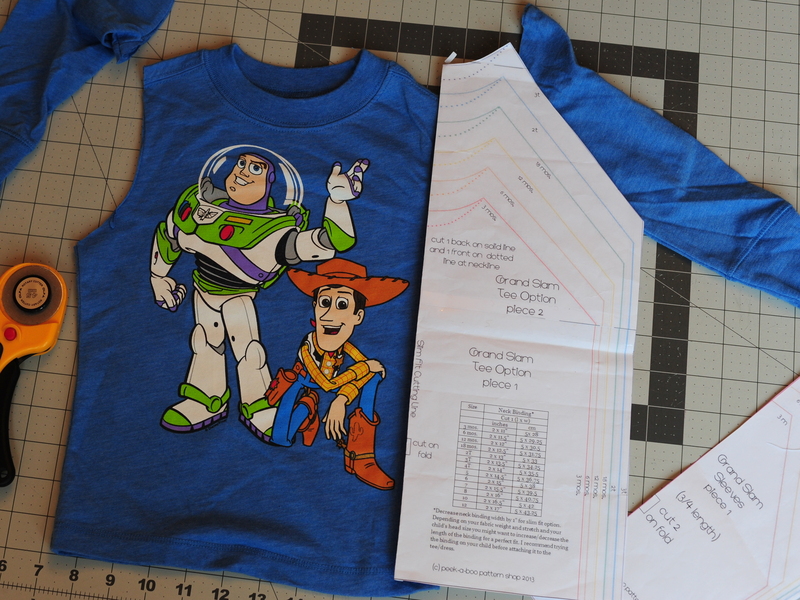 Start by measuring around your pattern piece, and note the height and width from the highest/widest point. 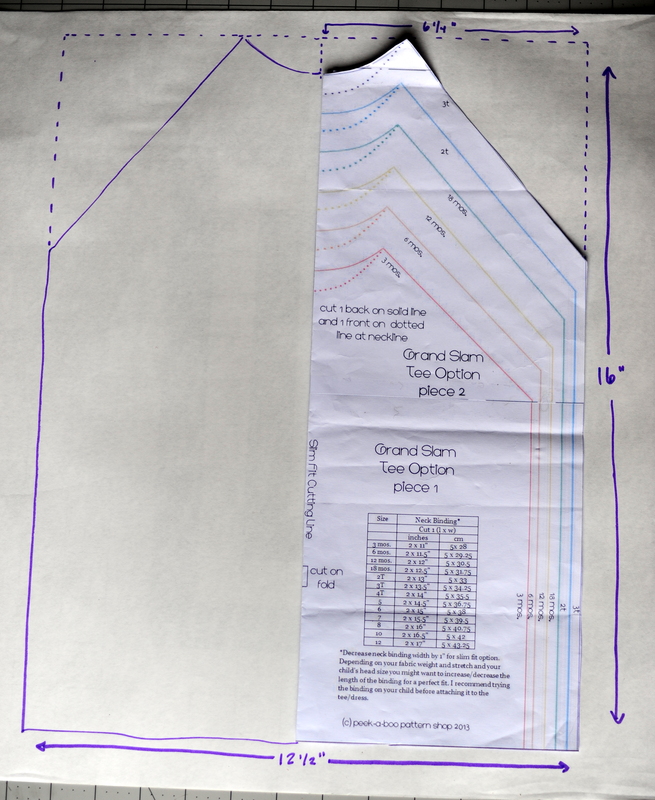 For my 3T Grand Slam tee (slim fit), I needed a rectangle that was 16″ tall by 12 1/2″ wide – see the photo below for how I arrived at these dimensions. grainy nighttime pic, but hopefully you get the idea! 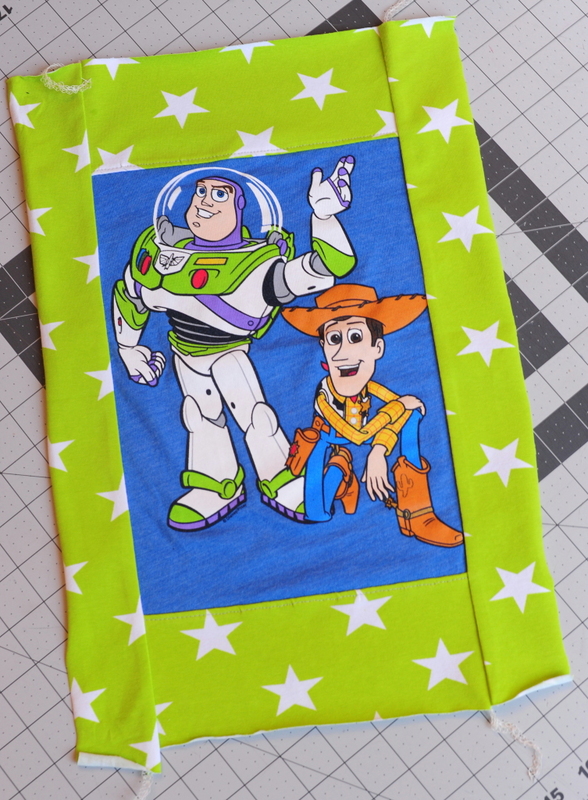 The Toy Story tee that I had for my little guy was about 1-2 sizes too small, so I cut down around the graphic until it was a nice even rectangle. I’ll refer to this as my panel from here on – in this case it was 11″ tall by 8″ wide. So, I needed to add 5″ to the height and 4 1/2″ to the width. You can decide if you want to add all of that to the top or bottom, or split it between the two as I did. It’s really just a design/aesthetic choice. 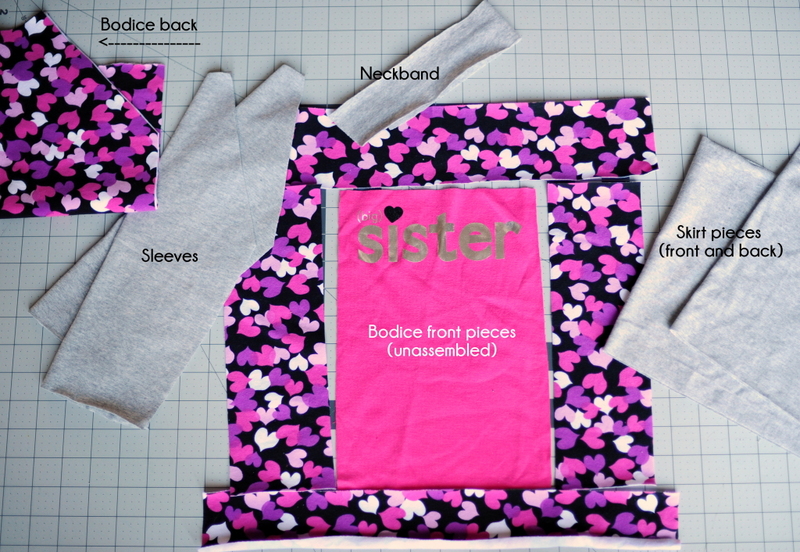 (Actually, if you look at the big sister dress above, you’ll notice that the graphic sits rather high on the bodice – I had wanted to cut the panel much smaller but my daughter wanted a big pink panel so we went with that. I think she looks a little like a robot, but hey, she likes it. 😉 ) You can see in the photo below how I cut the strips to surround the panel and make up the rest of the bodice. 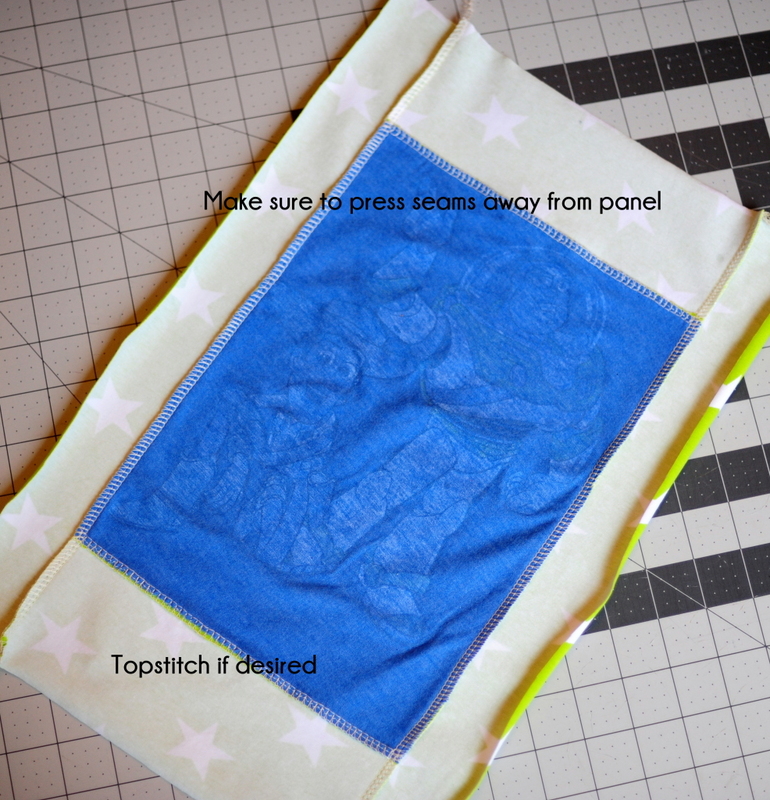 I attached the side pieces to the panel first, pressed them toward the sides, and then attached the top and bottom strips. I pressed those away from the panel as well. You can topstitch those seams to keep them flat if you prefer, I’ve done that (with a long straight stitch) and it is a nice finish. 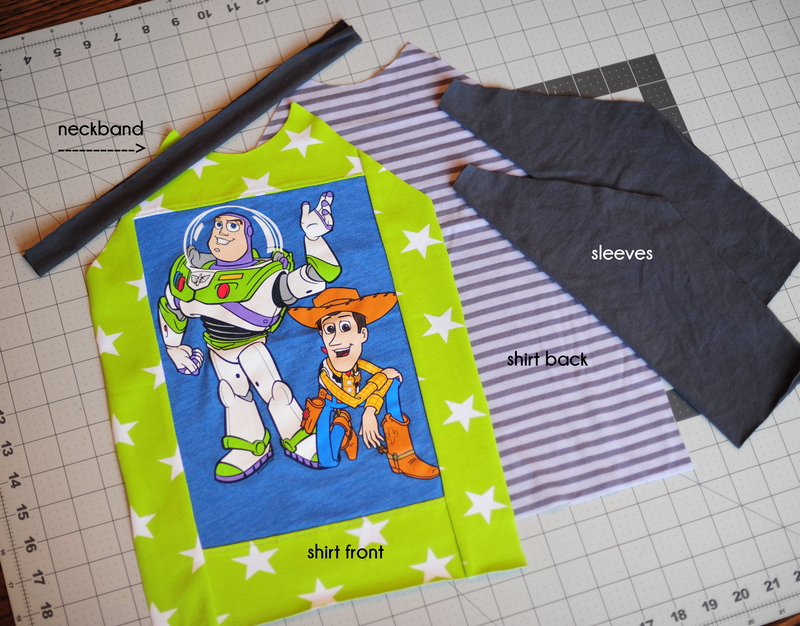 If you’re making a tee, assemble per pattern instructions, hem the sleeves and the bottom and you’re done! If you’re adding a skirt, there are lots of different ways you can do this. 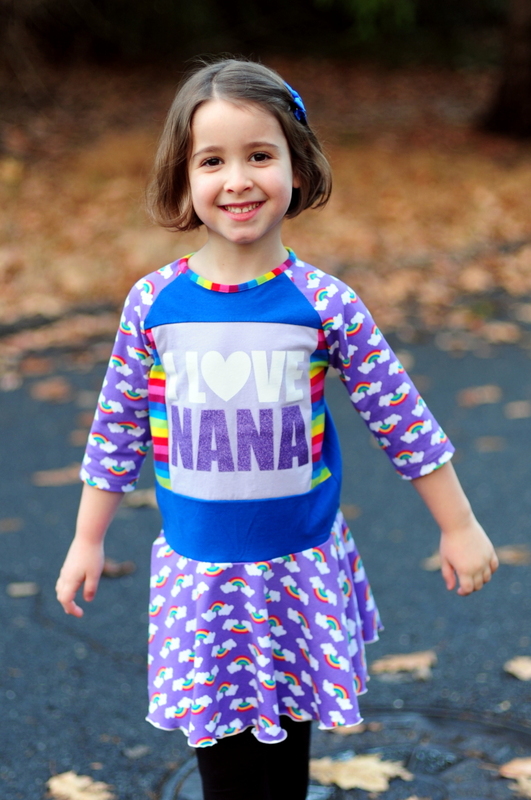 For the “I Love Nana” dress, I added a short circle skirt and did a rolled hem on my serger to finish the edge. I used a pattern piece that I had on hand from another dress pattern, but you can always draft your own using the width of the bodice to calculate the radius you’ll need for the circle skirt. There are a number of tutorials online to help if you get stuck with the calculations. 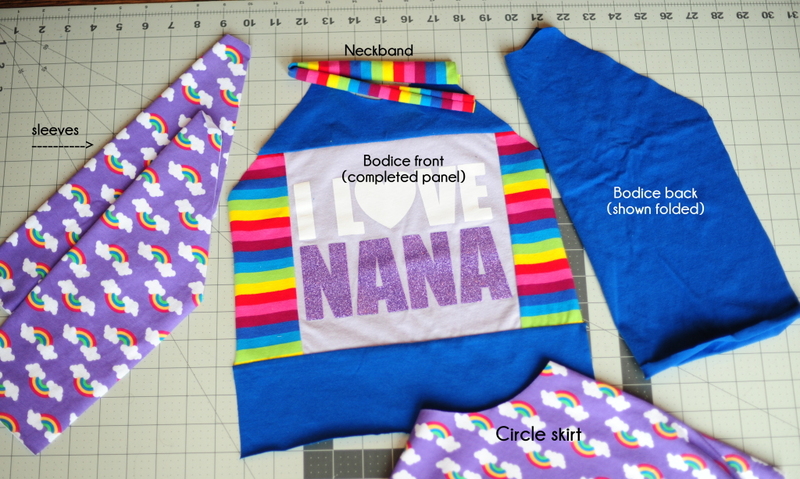 I’ve used the one from Dana at MADE here and this pattern from Figgy’s is great, too. You can also add a simple gathered skirt to the bodice. 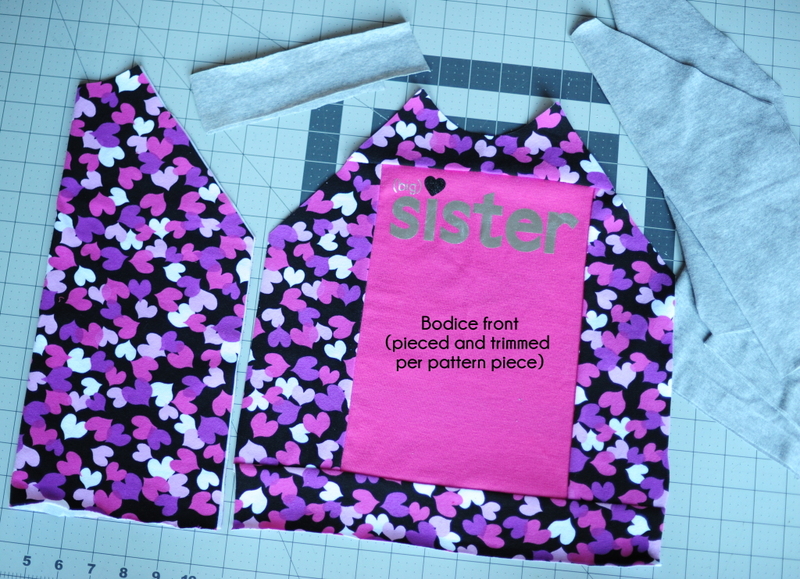 For the “big sister” dress, I cut front and back panels that were twice the width of the bodice and gathered to fit. 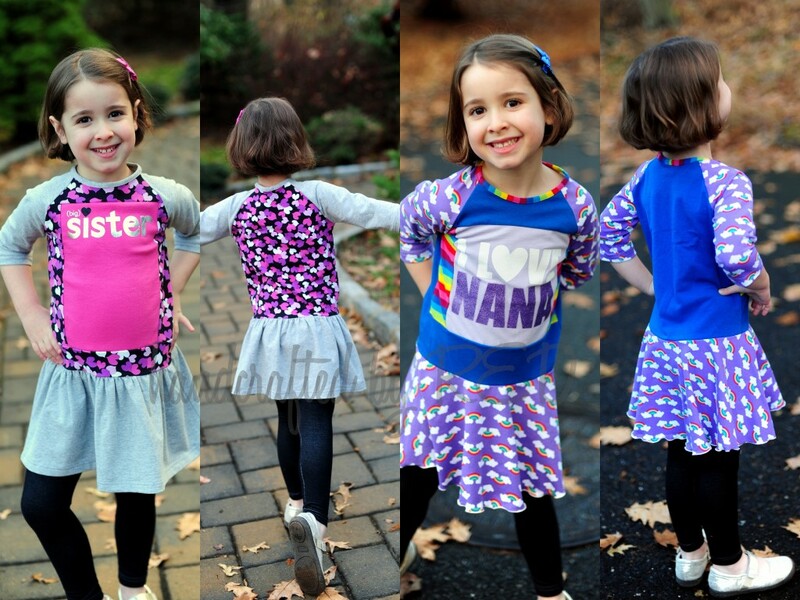 I made mine a little on the short side, since Miss P wears these as playdresses with leggings underneath. Usually a ratio of 1.5-2x the width of the bodice will give you a nice full skirt that isn’t too heavy but still spins and twirls well. 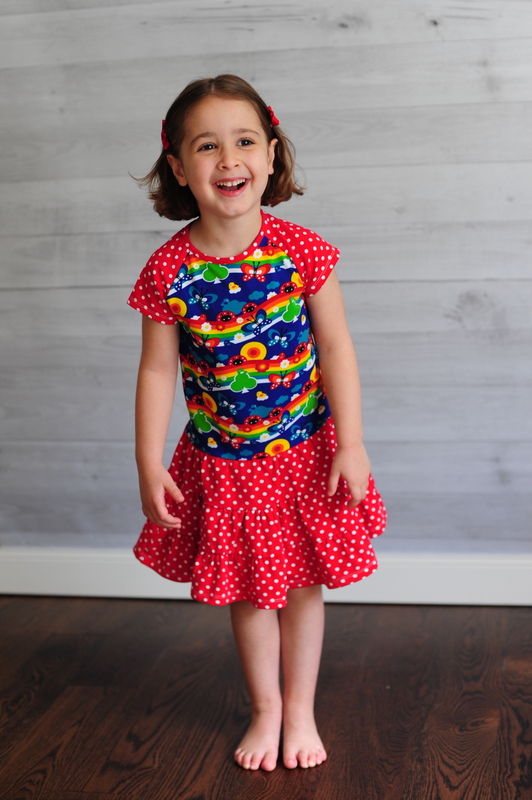 Miss P has also requested one with a tiered skirt, like this dress (shown below) that I made for my first PAB tutorial – I have a cute My Little Pony tee stashed away that I think would be cute for this style. That tutorial has tips for how to calculate the height and width for your tiers, and can be found here. I like to bind the necklines of these dresses instead of using the neckband, since I think it makes the neckline a little more feminine.